On the first night of spring break, Lillian convinced us to have dinner at Chick-fil-a. She just recently starting eating their chicken sandwiches. She can't eat a whole one but it sure makes her feel like she is more grown up trying! Dinner was going normal, Ev throwing her food, Nat not paying attention to anyone and me trying to keep it from escalating to chaos. Lillian looks at me and says "Why is there so much blood on my chicken?" We all look at her and there is her tooth dangling! We couldn't help it, all of us started laughing! Lillian has stressed over how she was going to lose her tooth, when it was going to happen and now finally it happened without one ounce of pain! 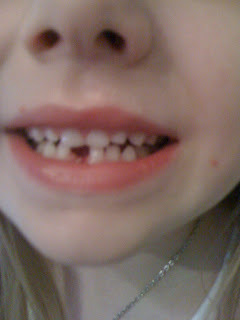 Now we are looking forward to the tooth fairy visiting when she gets back from her grandparents!